I stripped my 2015 xrx down a couple of days ago, all the intlets were in spec but all the exhaust were tight so have had to order a few shims which I'm waiting for so I can put it all back together. 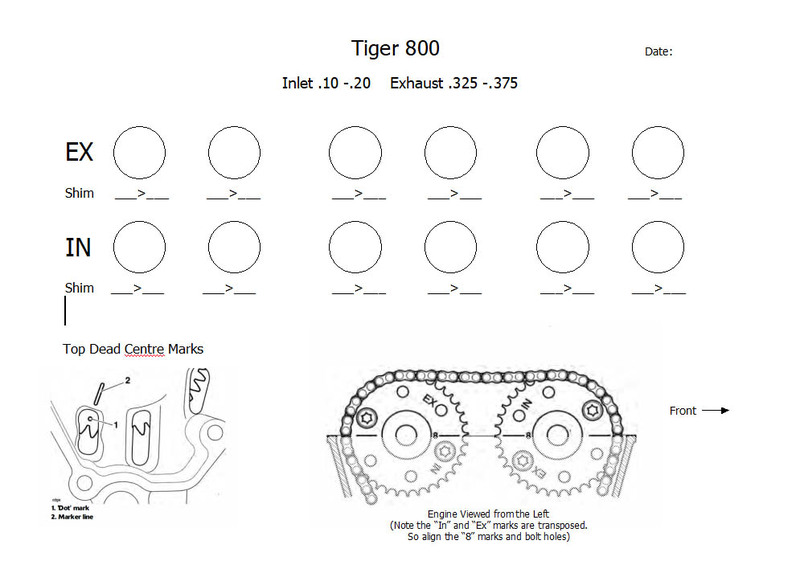 Reading the Triumph maintenance manual it seems that the camshafts have to be re-timed at 12k miles on the 2015 onwards engines, has anyone actually done it as seems to be a good few pounds worth of specialist tools or is it safe to just put back together as was?. I too am interested in the 20,000 km s cam timing adjustment info'. Here's the extract from the forum thread above with the part no's needed. The most expensive item is T388609. Just checked and that is over £250 of tools that will be used once unless the timing chain is changed at some point in the future. I emailed muddy sump earlier today after posting on here, he advised that he always does the camshaft timing as he has the tools but has come across a lot of bikes at 24k miles that should have had it done by the servicing main dealer during the 12k service that haven't had it done as the original bolts on the camshafts still have the blue paint meaning the haven't been replaced. He also advised that older variants of Triumph bikes didn't have adjustable cam shafts and ran fine. Think I will put it back together as it is. All the timing marks lined up spot on so doesn't appear to be out at all. I made this adjustment setting camshaft sprockets with replacement of 4 screws. I found 1 better engine operation, with more torque and power. Consumption has not increased. I had talked about it on the forum, explaining that my local consessionaire looked surprised when I asked him for a quote for the tools (camshaft lock, chain tensioner, motor lock, 4 screws of gables, joints) hinting that he never practiced it, despite Triumph recommendations !!! My opinion: This factory distribution setting is made to pass Euro antipollution standards (evolution in 2015), and generates 1 clamping, then the manufacturer recommends correcting this setting after 20000Kms, to fully exploit this engine. That's a handy sheet, thanks for that. And I just did the same procedure again at the 24k mile service. The cam chain had slightly stretched again so if you bought the special tools then I'd keep them for the whole time you own the bike.